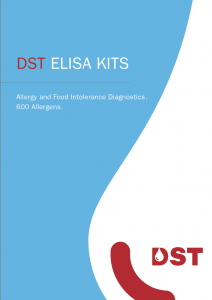 The ELISA Kit from DST GmbH for the detection of specific IgE (human) is a laboratory use enzyme immunoassay for allergy diagnostics. The assay is for quantitative determination of specific lgE antibodies against a selection of over 600 allergens for the serological diagnosis of type 1 allergies (immediate type) in patients. Flexible and customizable panels are available. Point-to-point regression in based on the measured absorptions on the 6-point standard curve. The identified units/ml can be assigned to CAP classes and represent the degree of the specific IgE sensitization. Allergens are bound on the surface of each well of the microtiter plate. For testing, a diluted sample (serum or plasma) is added to the wells. Specific IgE antibodies of the sample bind to the antigens in the wells during incubation, and non-bound components of serum or plasma are washed away after incubation. Subsequently, digoxigenin-labeled anti-human IgE antibodies and radish peroxidase coupled anti-digoxigenin antibodies (conjugate) are added. The digoxigenin-labeled anti-human IgE antibodies bind to IgE antibodies of the sample, standards and controls. The conjugate binds to the digoxigenin-labeled anti-human IgE antibodies. Subsequently, un-bound detection antibodies are washed away. A color substrate TMB (3,3‘, 5,5‘-tetramethylbenzidine) is added, which is converted by the horseradish peroxidase conjugate bound enzyme. The reaction is stopped by adding a stop solution. A yellow dye is formed and the respective intensity correlates with the proportional amount of locally-bound antibody. The dye formed is quantified photometrically by measuring the extinction. The quantification of the tests is carried out using a point-to-point regression of a 6-point standard curve. Standards are calibrated according to the WHO reference serum 75/5021. The identified units/mL can be assigned to the respective CAP-classes and provide the level of specific IgE sensitization (See table below). The allergy diagnostics kit quantitatively determines the amount of total IgE antibodies in serum or plasma, for the diagnosis of an existing type 1 allergy. 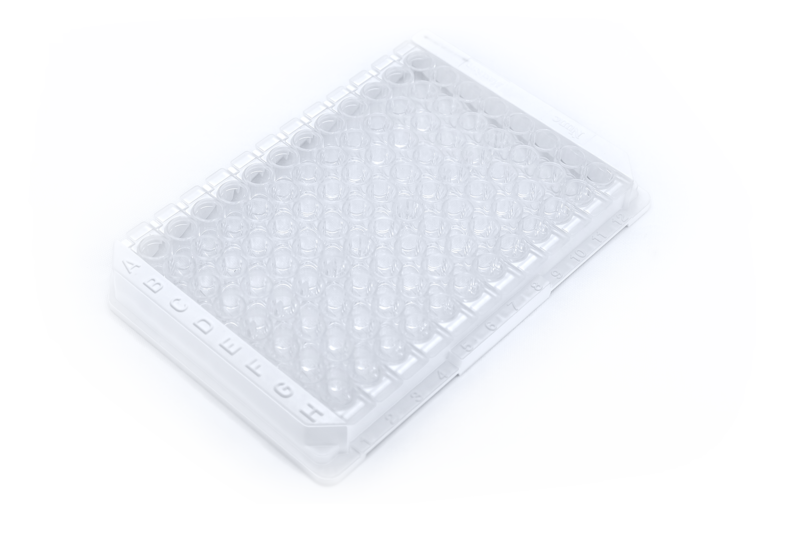 12 microtiter plate strips are included, each with 8 wells. The result provided in concentration range of 0 – 1,000 U/ml. The quantification of total IgE is based on a sandwich ELISA protocol (Enzyme Linked Immunosorbent Assay). 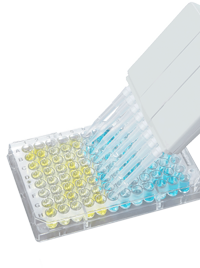 The wells of the microtiter strips are coated with polyclonal anti-IgE antibodies which bind the existing immunoglobulin from the sample. Detection occurs with a HRP conjugate (horseradish), which makes the visual evaluation and quantification of bound antibodies possible. The results are analysed photometrically at 405 nm after the reaction is stopped.